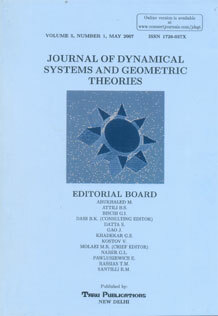 The Journal of Dynamical Systems and Geometric Theories is a refereed journal following two-referee system which is published in one volume per year of two issues in the months of May and November. From 2007 it is also available in Online version. It is the intention of the JDSGT to publish a broad range of research, survey and expository papers on dynamical systems and geometry, the interactions between these two subjects and their relationships with the other branches of knowledge. The intended audience consists of mathematicians as well as theoretical and mathematical physicists whose interests the areas of dynamics and geometry, broadly interpreted.